Hyderabad: Six months before a new international airport is set to open here, the company operating the facility says it has lined up several foreign airlines—Kuwait Airways, Etihad Airways, AirArabia, Iran National Airlines and British Airways—for flights. “Even some other airlines which are not very well-known also want to start (flights)," said T. Srinagesh, chief operating officer of Hyderabad International Airport Ltd (Hial). “We have got very positive indications from Thailand’s NokAir and Singapore-based Tiger Airways. Once the facility is there, it is easier to convince them." 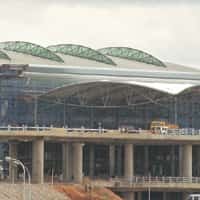 The Hyderbad airport is nearly 80% complete and is finalizing most of the concession agreements, he said. Both the airport here and a new one also coming up in Bangalore are set to start around the same time—around March—and are now wooing airlines with new facilities that promise better aircraft turnaround times, efficient processes and substantial passenger traffic. “The growth rates are very robust," maintains Srinagesh. “The domestic traffic is growing at 46% and international at 20%. The latter is mainly lower because of transfer of operations. For starting international services, you have to set up ground handling, operating offices (from scratch). So it’s a waste of resources if you start here (at an existing airport in Begumpet) and then move." The new airport, an hour away from much of the city and spread over a 5,000-acre site, can also handle new aircraft, including the world’s largest passenger plane, the Airbus A380 or the heaviest, the Russian-made cargo plane AN-225. Meanwhile, it is not surprising that the initial interest in adding flights to Hyderabad has come primarily from airlines in West Asia. In addition to their aggressive global expansion, Hyderabad already has a strong traffic flow to that region. “Our traffic distribution is roughly 30% to US and 30% Middle East," notes Srinagesh. “The balance is shared between Europe and South-East Asia. The reason for this is that the city supplies a lot of manpower. Both the high-end, that is, the software manpower which goes to the US, and also a lot of trade skills like masons, carpenters, plumbers, drivers... that goes to the Middle East." Emirates already has eight flights a week from Hyderabad to Dubai. Hyderabad has an average of 12 daily international flights from 11 airlines, including Lufthansa. Despite the seeming initial interest from overseas airlines, the airport isn’t counting on new flights alone to generate revenue. In fact, it hopes to make up for most of the Rs2,478 crore spent on the first phase of development through non-flying operations such as ground handling fees, hotel, aviation fuel and advertising. The annual revenues from the current Begumpet airport, according to rough estimates by Hial, stand at about Rs200-250 crore. This excludes the airport charges such as landing parking and route navigation charges, which will continue to remain with the Airports Authority of India. The bigger challenge for the new airport will be its distance from much of Hyderabad’s business and residential nei-ghbourhoods. Rental car rates will be “no less than Rs600," predicts a driver for Raj Travels and Tours, a local car rental company. “For an AC (air-conditioned) cab, the rates are over Rs900." Such costs and commuting times to airport, both of which are likely to go down as connections improve, will factor into traffic especially for those who are using low-cost airlines on short hops into the city, says one airline official who did not wished to be named. Hial’s Srinagesh says some of these issues are being addressed. Operators are being lined up to start bus services until connectivity impro-ves—an expressway will be at least 50% complete by next year. “We are tendering out for bus services from the city and to the airport, which will be ju-st under Rs100 one-way," he said. “I don’t see connectivity as an issue."